I’ve been a Christ follower for as long as I can remember. I spent 28 years trying to figure out what my calling was. So, why am I not opening an orphanage in South America, or spending my days feeding hungry children in the streets, or standing on a big stage preaching to thousands of women? Lord, where’s my calling? Where are all of these people whose lives I’m supposed to be changing? Jesus was a carpenter. Born in a manger. Why am I expecting to be this famous, gospel preaching, woman of faith, wondering why God hasn’t given me this fantastic calling? 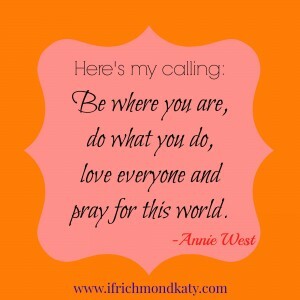 So, my idea of a “calling”—I’m throwing it out the window. 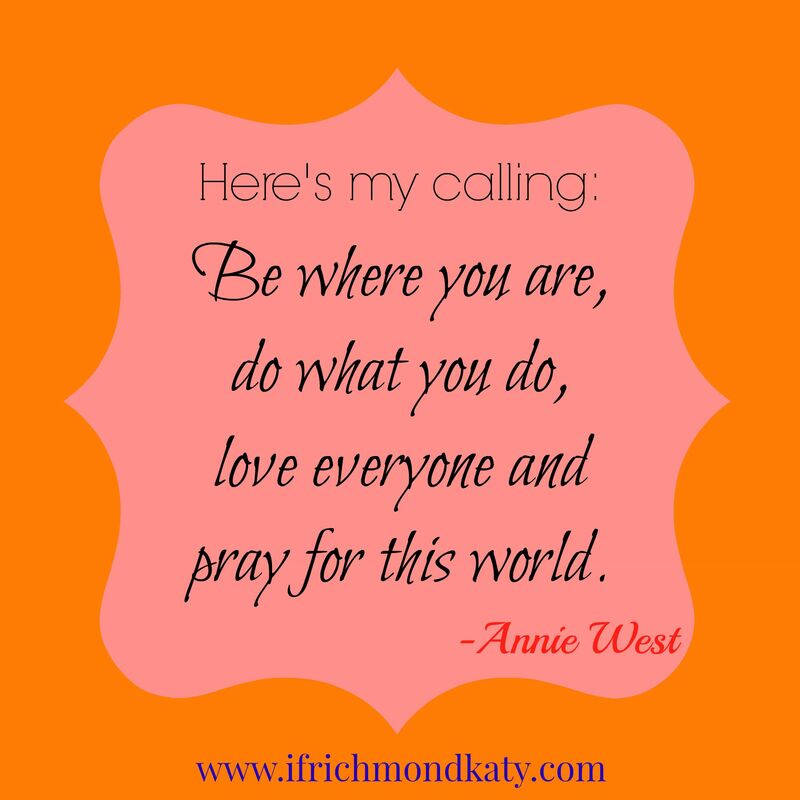 Because here’s my calling: Be where you are, do what you do, LOVE everyone, and pray for this world. That’s all of our calling. And then it hit me. The sadness. I had shielded my eyes to it for so long, but it was like the door burst open and I just couldn’t keep it shut anymore. There is sadness everywhere. This world is hurting, and there is injustice and hatred on every corner and in our homes and in our nations. We are blasting words of hate, and promoting ourselves instead of our God, and killing each other and standing idly by while it all happens. 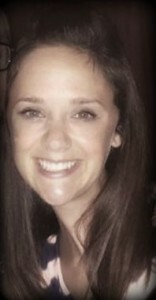 Oh, how my heart aches when I TRULY think about it. Times are changing and there is this hunger and this hurt and this burn in me and I see this shift…and you know what? You feel it too. I know it’s not just me; we all feel it, because it’s real. My instinct is this: I have to DO SOMETHING! I have to change it! I have to STOP it. This is not my war to win. I am not meant to be spectacular to this world; I am meant to be spectacular in my Father’s eyes. And if I want to be pleasing to my Father, then I do what I’m called to do. I love. And I get down on my hands and knees and I PRAY. So I’m asking you all to join me. Join me in hitting your knees and praying for our world. Pray for the brokenness and the hurt and the injustice and for your family and your neighbors and for your enemies and for those who agree with you and those who oppose you. This is where the power is. It’s right in front of you. It’s in your humble cries to the One who is actually capable of changing the world. Join me for IF: Pray Richmond/Katy on Monday, September 14th, 2015, 7:30 pm at Parkway Fellowship Westpark Campus Youth Building.